Surgeons today rely on flat, black-and-white images when preparing to operate. Soon, they may get to prepare with 3-D pictures of patients’ health problems, courtesy of the Israeli military. In Ohio, Israeli-based flight simulator technology is now helping surgeons prepare for complicated operations. The Surgery Rehearsal Platform brings technology that translates a two-dimensional image–say, a landscape with mountains or a picture of a kidney–into a three-dimensional world. It aims to revolutionize the way surgeons prepare for operations by enabling them to simulate the surgery on real patient data obtained through imaging studies, without actually operating on patients. The project grew out of a conversation overheard at a coffeeshop between two former Israeli Air Force officers specializing in high-end flight simulator programs. A neurosurgeon at University Hospitals Case Medical Center in Cleveland overheard them talking, and began to think that the technology could help surgeons, who are essentially flying blind when they enter difficult brain surgery cases. The pair started working together. But bringing technology from the theater of war into operating rooms came with some challenges, said Moty Avisar, who co-founded the company that makes the platform. “One of the key elements we brought with us from the flight simulator is the realism,” he said. “For a satellite image of a mountain, we’re interested in how the leaves reflect of the sun. Seventy to 80% of the immersion is in the visual. In surgery, we worked to visualize how the tissue reacts, and what the reflection of the operating room light looks like.” The platform also includes a haptic device that gives tactile feedback to the surgeon. The University Hospital Case Medical Center in Cleveland and UCLA are currently testing the 3-D imaging system on virtual brain aneurysms, comparing the outcomes with real surgeries that were done without it. 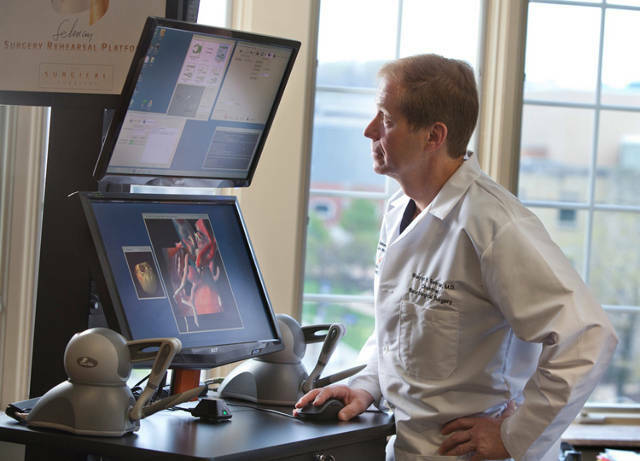 The platform can be used remotely by different surgeons, collaborating and learning from each other across the country. “Each participant has the entire visual reality of the patient. It’s real-time peer review in surgery,” said Avisar. Dr. Andrew Sloan, also a neurosurgeon and director of the University Hospitals Case Medical Center’s Brain Tumor and Neuro-Oncology Center said there are new applications for the platform, like modeling complicated brain tumor cases. 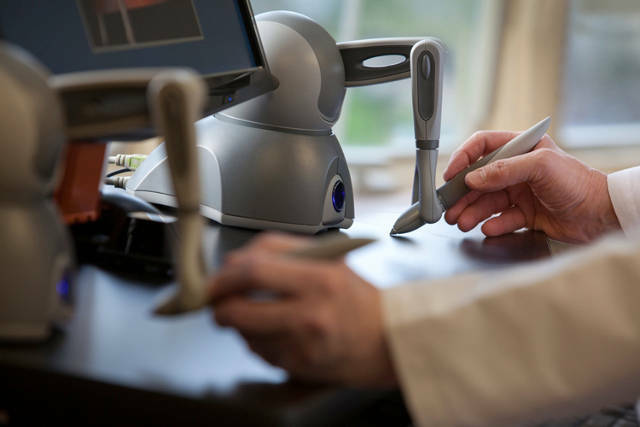 According to the Surgery Rehearsal Platform team, the technology can reduce costs as well as time–surgical clips are expensive, and having a better idea of where and how to use them can improve patient outcome and reduce costly mistakes. The platform is publicly launching this fall.